CAROL GALLIGAN PHOTO Barbara Barnes on the lawn of her Winthrop Road home. Barbara Barnes has been a political activist for as far back as she can remember. Her many involvements have included anti-colonial movements in Africa, the anti-Vietnam war movement at home and work on the Eugene McCarthy campaign in 1968, for starters. Through it all she’s been a consistent protagonist for the underdog. She grew up in Bristol, Connecticut, where her father was the owner publisher of the local paper, a daily, and was the third of four children. She has an older brother and was the “middle sister” of the three girls. 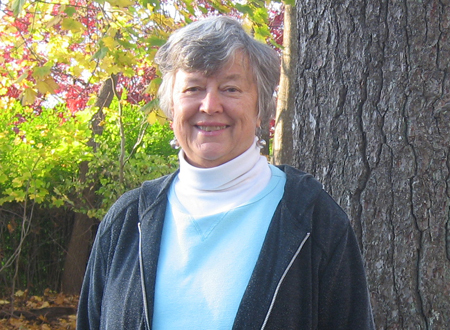 Graduating from Vassar in 1964, she immediately joined the Peace Corps and went to Kenya. She stayed for two years. “I actually taught in the sister school to the school where Obama’s father had gone 10 years earlier,” she said, a boarding school on the shores of the former Lake Victoria, newly named Lake Nyasa. She returned to the States in 1967 and enrolled in a master’s program at Teachers College, Columbia University. “I wanted to get certified so I could teach in New York City and then I did for a semester, at a junior high school in the South Bronx,” she said. “It was a sixth grade of children who spoke no English. This was before ESL (English as a Second Language) and other mandated programs for students came into being.” But the hard work and “burning the candle at both ends” took their toll and she came down with mononucleosis. Recovering, she wasn’t well enough to teach, but she did spend a few hours a day working for the Eugene McCarthy campaign, when he was seeking the Democratic Party’s nomination for the presidency. As she recovered, the campaign asked her to go to Indiana, then Nebraska and California. She was in Los Angeles when Robert Kennedy was assassinated and went on to the 1968 convention. “That was quite a year,” she said. During the next decade, she worked at Columbia University, administrating a Ford Foundation grant. She also taught GIs at Fort Dix and guided them in their last six months of service and helped them plan their future education. She led similar programs in community colleges in the city, supported the liberation movement in Mozambique and went back to school for her doctorate in education, which she earned in 1977. It was during that time that she met Eli Messinger, a child psychiatrist who had been politically active in New York City. They married in 1986 on the beach at Orient and had their wedding reception on the Island. Eli had three grown children from his former marriage and he and Barbara went on to have a son, Benjamin, now 24, and teaching math in a New Jersey private school. She continued to work in public policy programs, initially with women. She eventually took a position at Iona College in New Rochelle, directing non-traditional programs and cross disciplinary studies, women’s studies and peace studies. She left after six years to direct a federally-funded 10-college program in Westchester County “to improve the racial climate for learning,” she said. In recent years, she has worked with teachers and students in the New York City public schools to implement a curriculum on non-violent approaches to conflict resolution. She has also taught collaborative approaches to negotiation, mediation and conflict resolution at Teachers College. She is active with the International Institute for Peace Education and has given presentations in Turkey, Spain, Israel, Hungary, Costa Rica and Colombia. She’s been singing with that group for almost 15 years and has traveled with them widely. She also sang with the New York City Labor Chorus, songs of peace and protest, and on the group’s 20th anniversary last spring, she went with them to Cuba.